Performancing is pleased to announce the launch of its July 2007 free WordPress theme called Dark Laptop. 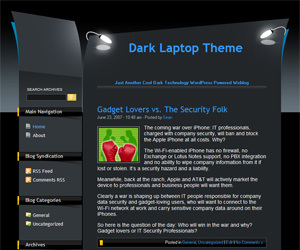 Dark Laptop is a stylistic, fresh, original blog design with a modern, late-night feel (bet you’ve never heard a theme described that way before;-) Designed by GeekWithLaptop, this theme is loaded with unique blog design elements which give it that extra-bold style missing from so many free themes. Dark Laptop is an extremely distinctive “look at me” WordPress theme and it would work well for blogs on topics ranging from city-life and movies to gadgets and tech. Update: Dark Laptop has been updated for compatibility with WordPress 2.7 and up. Download the latest version here. Visit the official Performancing forums for support.